Are you planning a birthday party? Paintball is a great way to celebrate a birthday. 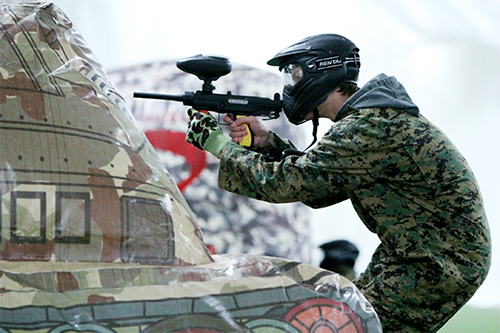 At Air Assault Indoor Paintball we offer two ways for your party to play paintball, walk-on play and private play. Read on and we’ll explain the walk-on and private play options. The main benefit of private play is your group won’t be mixed in with other players. You have complete control of who’s playing with your group. You’ll also be able to schedule your party for a time that works best for you and your guests. The private play option is especially popular with younger birthday parties. New players also prefer the private party option. As a private party, new players are able to play at their own speed. This gives them time to learn how the equipment works and become familiar with the fundamentals of the game. New players also don’t have to worry about going up against experienced players when they’re part of a private game. Another advantage of being in a private play group is you’ll be assigned one of our staff members as your party host. Your party host is here to make sure you have the best time possible playing paintball. They’ll help you get geared up and ready to play paintball. They’ll also take you through a safety briefing to explain the rules of the game and answer any questions you might have. Once it’s time to play they’ll take you out onto the field and function as your referee. If you don’t have enough players for a private play group, or are just looking to play paintball with a larger group, our walk-on sessions are a great choice. Unlike other fields, we keep our rental players separate from players who have their own gun. We do this to make sure new players aren’t playing against more experienced players. Still not sure which option is best for your group? Give our party specialists a call at (651) 222-0300. They’ll work with you to put together the perfect day of paintball for your group.